The diary of a widower and his trials and tribulations of raising his daughter in this warped and twisted world we live in. Oh, it's not all bad. Kay from 'Perhaps we learned something' put together this little string of offerings about the 7 deadly sins or "vices that lead to sin" as she put it. I decided to give it a whirl and talk about greed. I believe that you can be greedy without even being aware of it. In fact, all of the sins can be committed without any conscious thought. But, we're speaking of greed here. Ever been in a buffet line and there's people behind you and there are three slices of pizza left. You think nothing of it and take all three. People behind you will now have to wait for the next pizza. (and you know who you are, buddy!) You cut someone off on the highway because the person in front of you isn't going fast enough. The person you cut off now has to throw on their brakes and thus everyone behind him does the same. Because of your impatience, people now have to slow down thus causing slight ripples in traffic that lead to backups. These things are minor, but they are still examples of greed. You have gained while others "suffer." Is it something that you should go to hell for? I don't think so, but look at it this way. This kind of behavior causes the people who have been slighted to think bad thoughts or want to commit bad acts. The things that they want to say or do may be slight in our eyes, but in a world where we all live and work together, these add up. Almost a butterfly effect of emotions. Then again, I could be full of hot air! Let me know what you think. Check out Kay's blog and leave my pizza alone. I don't think you're full of hot air. Selfishness is a form of greed and small acts often reflect deeper ways of being. The pizza example was interesting to me since you said more pizza was coming. It would seem a greedier act if this was the last pizza available. Maybe taking the old cold pizza is actually doing the people behind you a favor since they'll get nice hot out of the oven slices... My problem in that situation would be that I'd probably forgo the pizza completely because someone else might want it more. But I'm just rambling. Thought provoking and wise piece. Greed doesn't have to be some huge thing to have an impact. Even small actions add up. Not rambling at all. If there were no more pizza coming then the deed becomes that much more evil. Can you tell I like pizza? 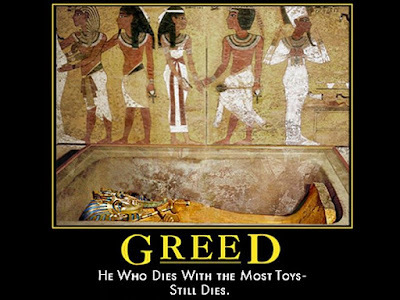 I think you hit the nail on the head with the whole "selfishness" aspect of greed. Has the economy bit into your movie budget?